Personal injury cases take on a wide variety of shapes and forms, from car accidents to premises liability and medical malpractice, from negligence cases to injuries that were caused intentionally, from scrapes and bruises to fatal injuries. No matter what the case is, though, you have gone through pain and suffering, and should be compensated by the person or people responsible for it. That is where the attorneys at The Brod Law Firm come in. Our Pennsylvania personal injury attorneys know how to fight for your interests in court, ensuring that you get the compensation that you need to make a full recovery. If you are involved in an accident and get hurt because of what someone else did and the case does not settle for a satisfactory amount you have the option of filing suit against those potentially responsible parties. This brings your case into the legal system which will be the means to determine who is at fault, and how much is owed you for the pain and suffering from the injuries that were caused. Typically in a Pennsylvania personal injury civil case, and depending upon the amount of damages involved your case your injury lawsuit would be heard before an arbitration panel, judge or judge and jury. The best lawyers prepare each case as though it will go to court. Gary Brod, a top rated Pennsylvania personal injury lawyer takes the work involved in case preparation very seriously and proceeds with trial in mind. Even though it may become necessary to file a car accident lawsuit this does not mean you will have to wait to be in a courtroom to achieve a result as we can settle your bodily injury claim before it reaches that stage. In fact, the majority of our cases that require litigation ultimately will result in a settlement. When I Sue Another Person or Business What Happens To Them? After the lawsuit is filed against the responsible party(s) they will turn over the paperwork to their insurance company lawyers who will handle their case. The money for an award or settlement will be paid by the person's or businesses insurance companies, not the parties you file suit against. Since these are civil claims the parties will not be criminally liable, unless it is connected to a criminal action such as a a DUI or associated with a criminal action similar to the Philadelphia Salvation Army building collapse cases or pier collapse cases where the owners and contractors were held to be criminally responsible for the loss of life involved. Of course, if you are sued you now know you will have peace of mind with the knowledge that your car accident insurance company, homeowners insurance or excess liability carrier will assume the burden of the lawsuit because that is what you pay for when you buy insurance. Litigation is an all encompassing term meaning anything that is directly related to the case that happens after a lawsuit is filed and is connected with the filed case. It includes responsive pleadings between the parties to the lawsuit, discovery, motions, hearings related to contested issues raised by counsel up to and including trial of the case against the responsible party(s). How Am I Involved in The Litigation Process? You as the injured party will be required to answer written questions called interrogatories requesting detailed information about your case, and the injuries you suffered. You will also be asked about your health and injuries prior to the incident which it the subject of the litigation. Often, you will be required to have your deposition taken by the opposing party's lawyer. The deposition involves your being asked about similar information as requested in the interrogatories, but you will be speaking in person and under oath. Of course, your own attorney will be present during that questioning. The remainder of the litigation process does not usually require your personal participation; only involving the attorneys and the court, except if your case goes to trial. Even though all personal injury cases present a new and unique set of facts, there are still only a handful of categories that they fall into. One of the most common types of personal injury cases involves car accidents. This includes any of the numerous types of crashes that can happen on our roads, such as truck accidents, motorcycle accidents, bicycle accidents, and even pedestrian accidents. A motorcycle is distinguished from other forms of transportation such as cars, trucks, buses, delivery vans, taxis and paratransit vehicles which are classified as motor vehicles. For example, in Pennsylvania the law treats you differently when you are a passenger in a motor vehicle as compared to riding on a motorcycle. Knowing the law in these areas can make the difference between winning and losing your case or how much you recover. Everyone on the road has a duty to keep other drivers safe. Unfortunately, distracted driving, drunk driving, and simple mistakes are a part of the world we live in. If any of these cause an accident that leads to your injury, then you need an attorney at The Brod Law Firm to represent you in court to get the compensation that you need to recover. Another common type of personal injury lawsuit stems from something that was made defectively, and this defect resulted in you getting hurt. Countless products hit the market in the United States alone that are poorly designed, made, or advertised. Oftentimes, these products break or malfunction without warning, putting you and the people around you at a significant risk of a terrible injury. When this happens, you could find yourself seriously injured, through no fault of your own. Seeking legal representation from the products liability attorneys at The Brod Law Firm is the best way to ensure that you get the help you need to make a full recovery. Whenever you go to the park or to a friend's house or to a grocery store, you are venturing into territory that someone else knows better than you do. Because the party that owns the area knows of the dangers of it far better than you do, the law requires that party to take reasonable steps to ensure your safety. If they do not take these steps and you get hurt because of their oversight, then they could be liable for your injuries and owe you compensation. A common premises liability situation is known as a “slip and fall,” and often happens in a retail store, like a supermarket. When you go to the store to buy things, you are rarely paying attention to the ground. Store owners know this – the whole point of advertising the products on their shelves is to attract your eyesight – and therefore have the responsibility to make the floor reasonably safe. When they do not uphold this duty, you can slip and fall and hurt yourself. When this happens, the store could be liable for your injuries because of their oversight, putting you in a position to file a personal injury lawsuit. Out of all of the types of a personal injury lawsuit, a medical malpractice lawsuit can be the most complex, least common, but also the most important. Medical malpractice suits often involve truly terrible injuries that have a long-lasting impact on your health and involve numerous medical procedures to fix properly. Because of their seriousness, medical malpractice lawsuits are also very complex. There are numerous laws in place in Pennsylvania to protect doctors who make mistakes. While these laws are supposed to keep the price of medical malpractice insurance down, they also prevent many lawsuits from making their way to court, leaving victims without the compensation that they deserve. Because of the numerous procedural hurdles in bringing a medical malpractice case to court, having an experienced medical malpractice attorney, like those at The Brod Law Firm, on your side is crucial. Top rated Philadelphia car accident attorney Gary Brod's direct approach and thorough preparation ensures the success of the cases he accepts. Each and every case is prepared from day one as though it will be tried in a courtroom. This process begins from the moment we accept your case. But this office is not an accident mill where we use a "cookie cutter" approach, as no two cases are the same and we take all cases we handle seriously because we know its your one case. Your case is unique and treated as such. The fact is that the majority of cases are settled before trial. Attorney Gary Brod and his team know that our opponents will take your case and us seriously if they know we have all the ammunition and are ready, willing and able to proceed to trial if a satisfactory settlement offer is not made. A personal injury lawsuit comes in a handful of forms, but every single case is unique and requires personalized attention. The personal injury attorneys at The Brod Law Firm understand this and provide the care and consideration that every case needs and deserves. If you have been hurt because of someone else's negligence, getting legal representation can be the best way to ensuring that you get the financial compensation that you need to make a full recovery. 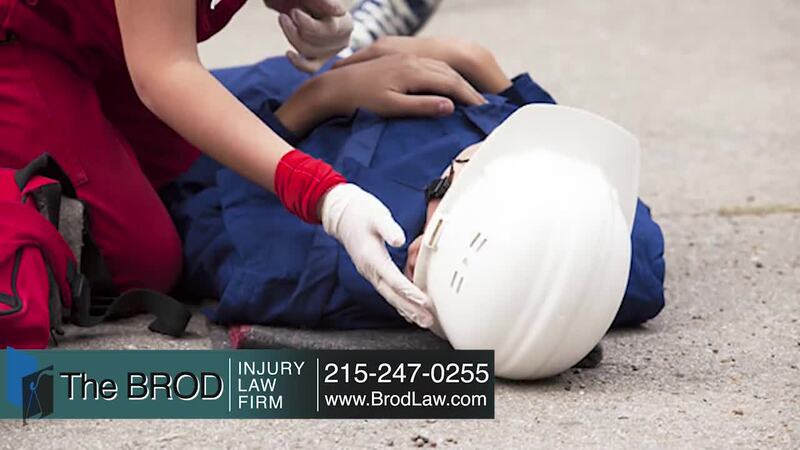 Contact the Philadelphia, Reading and Montgomery County, Pennsylvania personal injury lawyers at The Brod Law Firm online or at 1888-435-7946 for a free no obligation telephone consultation. While most of our clients are from central to southeastern Pennsylvania we handle matters throughout the entire state. One of our three offices will be most convenient for you as they are located near all major arteries.